Welcome to Day 14 of Trainwreck’d Society’s Month of Horror Showcase. Every day during the month of October, we will have a horror related interview and/or film review for your fright-filled reading pleasure! The set up will be the same as usual, but the topics will be far more terrifying. Enjoy! 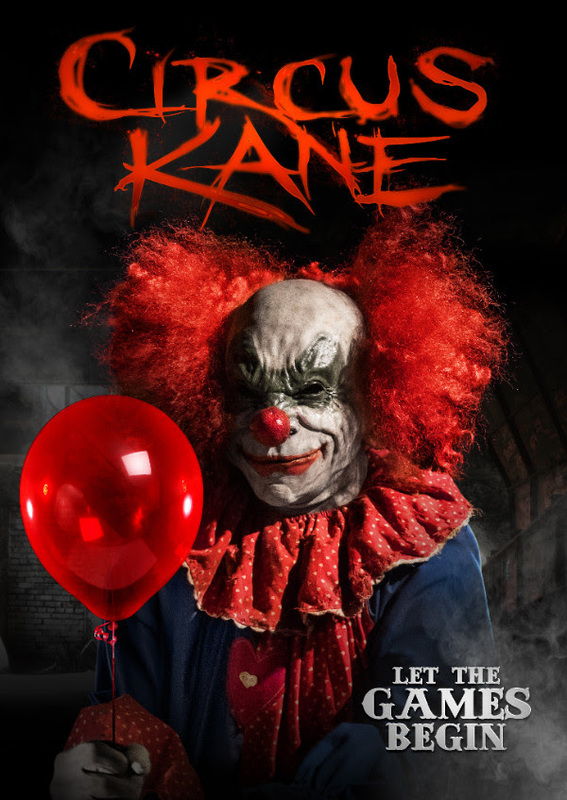 “The notorious and disgraced circus master, Balthazar Kane, invites an unsuspecting group of social media stars to the revival of his Circus Kane by promising $250,000 to any of them who can make it through the night. Kane’s true plan quickly proves to be far more sinister as the contestants realize more than money is on the line. The group must fight for their lives to escape Kane’s demented house of horrors. Hey folks! So we are doing something a tad bit different here. As you can tell, it is Saturday, which is of course a rarity for us as of lately. But, we have so much amazing content to share with you fine folks for our Month of Horror, that it has become necessary for us to work on Saturday. Which is totally worth it, I might add. Also, today is sort of a combo for you fine readers. We are here to talk about the amazing film Circus Kane, which is first of all a truly brilliant modern cinematic experience. But we also have a few quick words form the film’s director, Christopher Olen Ray. So we are combing a great film showcase with a great interview. You lucky son of a saints! Circus Kane is a wonderful film with a terrifying premise that is as visually stimulating as it is horrifying. Tim Abell does an absolutely incredible job as the partially titled character Balthazar Kane. He will honestly freak you the hell out to no end. And performances from Jonathan Lipnicki and newcomer Victoria Konefal are an absolute stand out. I will personally state here and now, that Circus Kane is the absolute perfect film for those of you who absolutely adore horror films but are feeling a bit trapped by the modern realm of terror cinema. If you are looking for something truly unique and exciting to check out in this wonderful month of all things frightening, I seriously can not recommend this brilliant film enough. So that is my plug for this amazing film that you can see now on VOD and other streaming platforms. I also have to say that it is absolutely incredible that this is a truly fucked up tale, but also happens to feature not only the adorable little kid from Jerry Maguire, but also Scut Farkus from A Christmas Story (1/3 of the writing team, Zack Ward.) I usually tend to leave this type of thing out of the intros, but I was laughing so damn hard when I figured this out that I feel a bit compelled to let you all know. Because I have to be honest with you all. And with that, here are some words from the film’s director Christopher Olen Ray. Tell us about the latest film. Circus Kane is about performer Balthazar Kane, who comes back for one last hooray. He creates a house of scares, tricks and traps for a set of new unexpected horror fans. Offering them $250k to survive his new house of haunts. This should definitely be Horror. There is a little bit of light hearted comedy in it but that is definitely the under tone. The blood puts it into more of Horror. There are a few. Tim Abell is always a pleasure to work with. His work as Kane is amazing. Johnathan Lipnicki was another person that just made my job easy. All in all the cast did a great job and fed off each other well. The look. We wanted to make the film have its own look. Myself, the DP Alexander Yellen and The Production Designer Fernando Valdez worked hand in hand to get that accomplished. We decided in the beginning to use as much practical as we could. So all the footage they are watching on the TVs is actually playing as they watch. Just one area. NOPE- I loved every minute of it. Even when things got rough, there is still no place I would rather be. HELL YEAH!!! Since I was little my family would watch more horror films in October. Didn’t really mean much since we liked them all the time. As a kid I couldn’t finish Evil Dead. For some reason the bit where he pulls the stick out of his leg still sticks with me. Who might your favourite horror monster icon be? The one time of the year I am fit in a little bit more. My house and office are Halloween everyday all year long. Yup. I have been many different thing over the years. My favourite was the Jack Nicholson Joker. I think there is a picture of me on my Facebook page in this look. Original Halloween and Corman’s Little Shop of Horrors. I do. Since every room has a different theme and I think we relate to a lot of different fears through out.